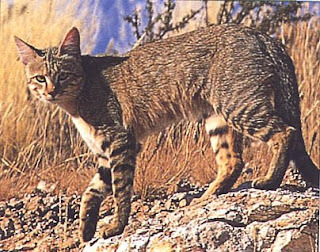 The African Wildcat (Felis silvestris lybica), also known as the Desert Cat, is a subspecies of the Wildcat (F. silvestris). They appear to have diverged from the other subspecies about 131,000 years ago. Some individual F. s. lybica were first domesticated about 10,000 years ago in the Middle East, and are the ancestors of the Domestic Cat. Remains of domesticated cats have been included in human burials as far back as 9,500 years ago in Cyprus. The African Wildcat is sandy brown to yellow gray in color, with black stripes on the tail. The fur is shorter than that of the European subspecies. It is also considerably smaller: the head-body length is 45 to 75 cm (17.7 to 29.5 inches), the tail 20 to 38 cm (7.87 to 15 inches), and the weight ranges from 3 to 6.5 kg (6.61 to 14.3 lbs). The African Wildcat is found in Africa and in the Middle East, in a wide range of habitats: steppes, savannas and bushland. The Sand Cat (Felis margarita) is the species found in even more arid areas. The African Wildcat eats primarily mice, rats and other small mammals. When the opportunity arises, it also eats birds, reptiles, amphibians and insects. The cat approaches its prey slowly, and attacks as soon as it reaches a distance of about one metre. 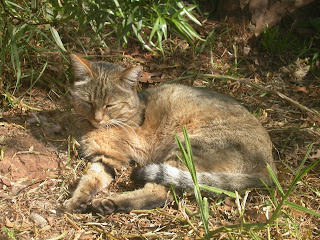 The African Wildcat is mainly active during the night and twilight. When confronted, the African Wildcat raises its hair to make itself seem larger and intimidate its opponent. In the daytime it usually hides in the bushes, although it is sometimes active on dark, cloudy days. The territory of a male overlaps with that of a few females, who defend the territory against intruders. A female gives birth to two to six kittens, with three being average. The African Wildcat often rests and gives birth in burrows or hollows in the ground. The gestation lasts between 56 and 69 days. The kittens are born blind and need the full care of the mother. Most kittens are born in the wet season, when there is sufficient food. They stay with their mother for five to six months, and are fertile after one year. Based on a mitochondrial DNA study of 979 domestic and wild cats from Europe, Asia, and Africa, Felis silvestris lybica split off from the European wild cat about 173,000 years ago, and from the subspecies F. s. ornata and F. s. cafra about 131,000 years ago. About 10,000 years ago, some Felis silvestris lybica individuals were domesticated in the Middle East. Modern domestic cats are derived from at least five "Mitochondrial Eves". 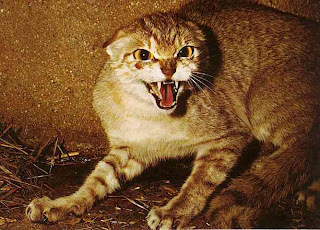 None of the other subspecies of Felis silvestris contributed to the domestic breed, and many of those subspecies' own mtDNA is being swamped by interbreeding with feral cats.